Description: The Characters in this new original Cloth Line uses highly detailed Cloth meshes designed by an award winning fashion designer using Marvelous Designer advanced fashion design tools and rigged to perfection for iClone standard characters. 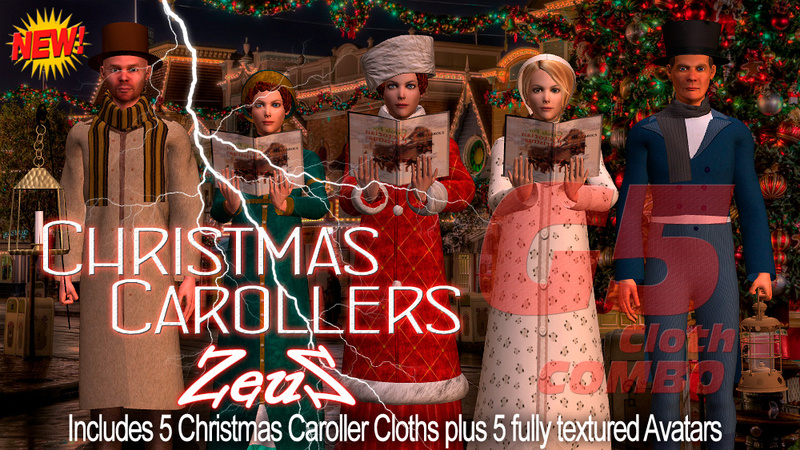 This pack includes 5 new G5 Native Multi-Layer Christmas Caroller Cloths specially designed for making Christmas Caroller Characters plus an incredible set of 5 fully textured characters. Lanterns, Hats and All Accessories included. These Marvelous Designer Cloths are true native G5 Cloths fully compatible with Reallusion's G5 Standard Characters., i.e. you can use all other standard G5 accessories, shoes, hands and heads on these character. Best used in Christmas Movie scenes! This pack includes a G5 Native Multi-Layer Marvelous Handkerchief Dress Cloth for Gwynn plus an incredible set of 6 fully detailed characters including an Exclusive Witch & Broom Character for Halloween! Heads, Hair, and accessories included. The Cloth includes a 4 layer Whole set Upper (Skin, Scarf, Handkerchief Skirt and Overskirt) plus a single layer Lower (Skin). Marvelous Designer Cloths are true native G5 Cloths which are fully compatible with Reallusion's G5 Standard Characters., i.e. you can use all other standard G5 accessories, shoes, hands and heads on these character. This pack includes 1 new G5 Native Multi-Layer Cloths specially designed for making Fantasy Gaming Characters such as those found in high end games plus 5 fully textured characters. All accessories included. The Cloth includes no less than an 11 layer Upper (Skin, Blanket, Back Skirt, Skirt Armor, Cloak, Shirt, Armor, Hood, Upper Belt, Lower Strap and Belt) plus a 2 layer Lower (Skin and Pants) and a fantastic pair of Boots! This Marvelous Designer Cloths is a true native G5 Cloths fully compatible with Reallusion's G5 Standard Characters., i.e. you can use all other standard G5 accessories, shoes, hands and heads on these character. This pack includes a G5 Native Multi-Layer Marvelous Indian Dokona Cloth for Gwynn plus an incredible set of 6 fully detailed characters. Heads, Hair, and accessories included. The Cloth includes a 7 layer Whole set Upper (Skin, Shirt, Dress, BlanketA, BlanketB, BlanketC and BlanketD) plus a single layer lower (Skin). Shoes and Accessories included. Description: This pack includes G5 Native Multi-Layer Female Indian Sari Cloth specially designed for making Indian Female Characters plus 6 fully textured Avatars. This Cloth includes a Triple Whole set Upper (Skin, Sari Shirt and Sash) plus a single layer Lower (Skin). Shoes and Accessories included. The Indian Sari Cloth is a true native G5 Cloths which is fully compatible with Reallusion's G5 Standard Characters., i.e. you can use all other standard G5 accessories, hands and heads on this character. This pack includes 6 new G5 Native Multi-Layer Cloths specially tailored for the superb Hutch Character originally designed by Sen plus 12 fully textured characters. All accessories included. The Cloths in this Pack include several business outfits for Hutch including Pants, Shirt, Cardigan, Jacket, Short Overcoat and Long Winter Coat. Best used in any scene requiring a beautifully dressed Hutch character! This pack includes 5 new G5 Native Multi-Layer Biblical Cloths specially designed for making all Characters of the Nativity scene including Joseph, Mary (Pregnant), a Baby plus the 3 Wiseman (Melchior, Caspar and Balthazar) plus an incredible set of 7 fully textured characters including Jesus (Adult). Accessories included. 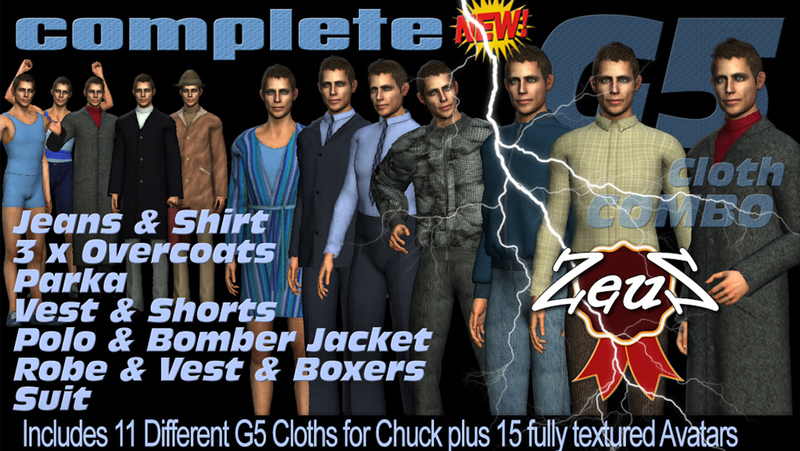 This pack includes a COMPLETE wardrobe for Chuck with no less than 11 G5 Native Multi-Layer Cloths including Jeans & Shirt, 3 Overcoats of different lengths, Parka & Jeans, Polo Shirt & Bomber Jacket, Robe Vest & Boxers, Shorts & Vest Top, Suit with and without the Jacket and Vest and Boxers plus 15 fully textured characters. Accessories included. Description: The Cloths in this new original Cloth Line uses highly detailed Cloth meshes designed by a fashion artist using Marvelous Designer advanced fashion design tools and rigged to perfection for iClone standard characters. This pack includes 3 new Child Cloth and a new exclusive Character called "Mia" specially designed to be Matilda's new friend in the neighborhood plus an incredible set of 15 fully detailed characters. Flip flops, runners, Hats and a Headband accessories included. 1) Mia G5 Casual Dress Cloth; This Cloth includes a 3 layer Upper (Skin, Shirt and Belt plus a dual layer Lower (Skin, Skirt),. 2) Mia G5 Casual Shorts Cloth; This Cloth includes a dual layer Upper (Skin, Top) plus a triple layer Lower (Skin, Shorts, Belt). 3) Mia G5 Pantaloons Cloth; This Cloth includes a dual layer Whole set Upper (Skin, Top) plus a dual layer Lower (Skin, Pantaloons). These Marvelous Designer Cloths are true native G5 Cloths designed by a fashion designer and rigged to the iClone standard skeleton in a way to be fully compatible with Reallusion's G5 Standard Characters., i.e. you can use all other standard G5 accessories, shoes, hands and heads on these character.